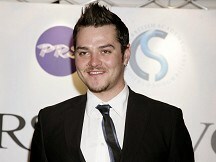 Matt Willis is joining the cast of West End musical Wicked. The former Busted star will be playing Fiyero in the stage production, billed as the "untold story of the Witches of Oz". Matt will be joining BBC talent show finalist Rachel Tucker, who has been playing witch Elphaba, on stage. He said: "I'm really excited to be joining the cast of this incredible musical. Fiyero is a brilliant part". He added: "I can't wait to be working with the awesome Rachel Tucker and the new company." The 28-year-old former I'm A Celebrity...Get Me Out of Here! winner made his West End debut in Flashdance last year and most recently starred as Chuck in the UK national tour of Footloose. Wicked, which has been seen by almost four million people, celebrates its fifth birthday this month. Matt, who is married to Big Brother's Bit On The Side presenter Emma Willis, will join the Olivier Award-winning musical, at the Apollo Victoria Theatre in London, from December 12.